ASTUS 20.2 and its sport model Astus 20.2S have been presented at the Paris Nautic 2009 exhibition. its successor has now arrived. Astus 20.2 was born from the desire of bringing improvement and of meeting your requirements. A trimaran wiht many advantages. 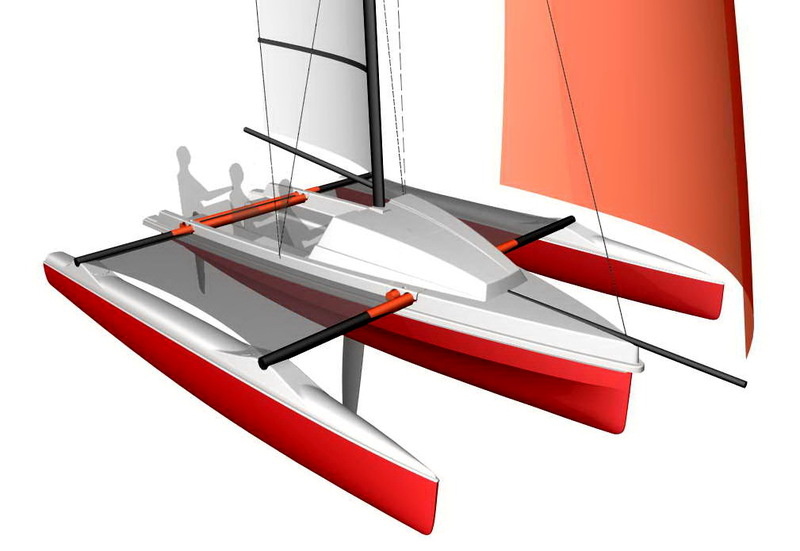 Speed : an outstanding weight/sail ratio : 24 m2 upwind for 350 kg. Few water entries with the water deflectors stepped hull. 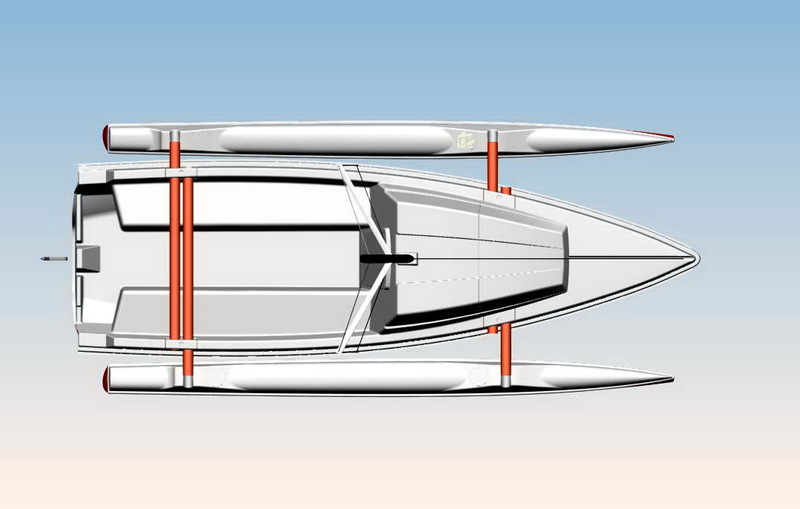 Width was also increased to reach 4.25 m.
Safety : the central hull and the floats show a high floatbility potential. Weak draught : daggerboard and pivoting rudder, ideal for coast navigation and coming alongside the beach. Quick to flod and without any dismantlement ashore or when sailing (to put in a catway). A simple and pragmatic use : easy to transport and to handle. Telescopic floats wich thanks to the cotter pins allow to pass from a 4.25 m to a 2.40 m width and vice versa without being obliged to disantle the floats. A mast easy to step up, 15 kg light, with a 7.50 m height. 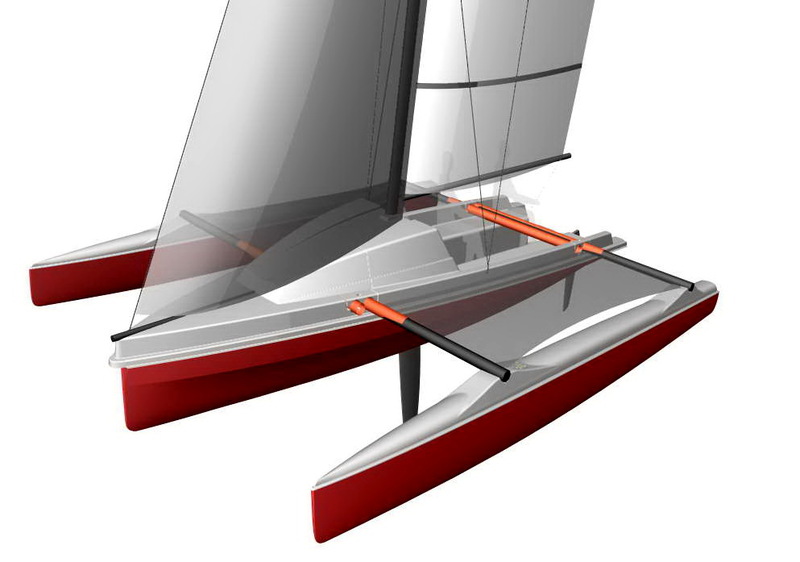 On the 20.2, a lateral mast position will allow an easy stepping of the mast. A single person is able to rig it and to launch it to water in less than 20 mn. The vast 2.5 m cockpit is protected by backs with lockers for the storage. 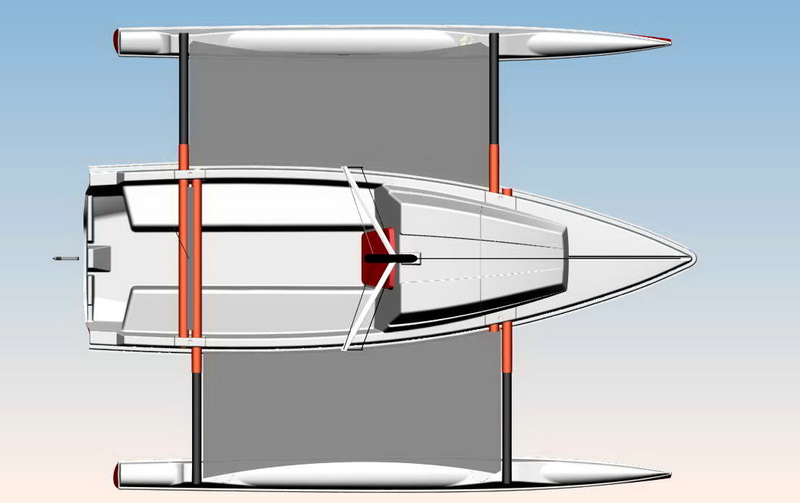 The position of the front beams allows to easy enter the cabin. - The cabin with the bunk of 115 cm width and 220 cm lenght and more ergonomic allows the storage of all the materials and can be a safe shelter for the children. - A front locker used as chain locker and where it is possible to store the fenders. The boatyard has chosen a polyester contruction which allows a better cost production, and which is resistant and easy to maintain. A family version to quietly sail at a very competitive price. A sport version to meet the requirement of the Astus 20.2 S regatta team.